We offer next working day delivery to the majority of the UK mainland (excluding Highlands) for a flat fee of £8.99 for any quantity. Delivery on orders over £250 is free of charge. We've designed this site to help people find that most elusive of drinks - sulphite free wine. These are natural wines made without the addition of any chemicals, using only natural yeasts. 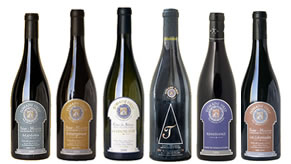 Jane and I set up our own retail website in 2007 Good Wine Online as a natural expansion of our wholesaling business, when we spotted a sector of the market that wasn't being particularly well catered for, namely good quality wines at competitive prices. Over the last seven years we have sourced a portfolio of excellent quality, small production wines from all over the world. Now, small family producers who make this level of wine tend to use only minimal sulphur, and as Jane has suffered from a sulphite intolerance for over 10 years, the portfolio we created was predominantly all low sulphite wines. We've since expanded our range to include good quality sulphite free wines, something which is extremely rare! There are several wineries mainly in the USA, France and Australia who produce wines without the addition of sulphur, but there are only a few who can make them taste great! We now have over 40 sulphite free wines, and well over a hundred very low sulphite wines for you to try. Please note a very important point here - organic or biodynamic wines are not necessarily low in sulphites! In fact many of them contain just as much free sulphite as any other wine! If you are intolerant to sulphites you should look for low sulphite or sulphite free wines. On another note, there is a lot of confusing and conflicting information available on the internet. It is true that 'sulphite free wine' does not technically exist because miniscule amounts of bound sulphites are created during the fermentation process. However these bound sulphites are completely harmless even to sulphite intolerant people. The US and EU governments class a wine as 'sulphite free' if it contains less than 10 mg/l total sulphur, so the term is actually legally recognised and hence is actively used. Wines with less than 10 mg/l are not required to state 'contains sulphites' on the label.